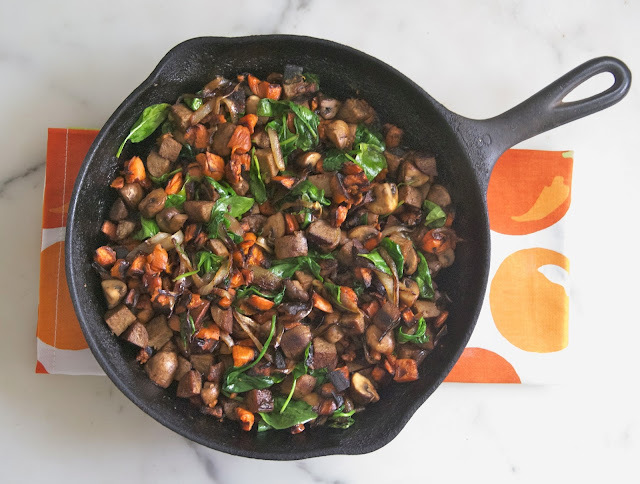 This is not your ordinary breakfast hash, this is a dressed up, one pot meal kind of hash. It's made with roasted sweet potatoes, caramelized onions, mushrooms and meatless sausage. I threw a few cups of spinach in at the end to complete it and drizzled the top with an aged sweet balsamic vinegar. Caramelizing onions takes about 30 minutes so you want to start them first. 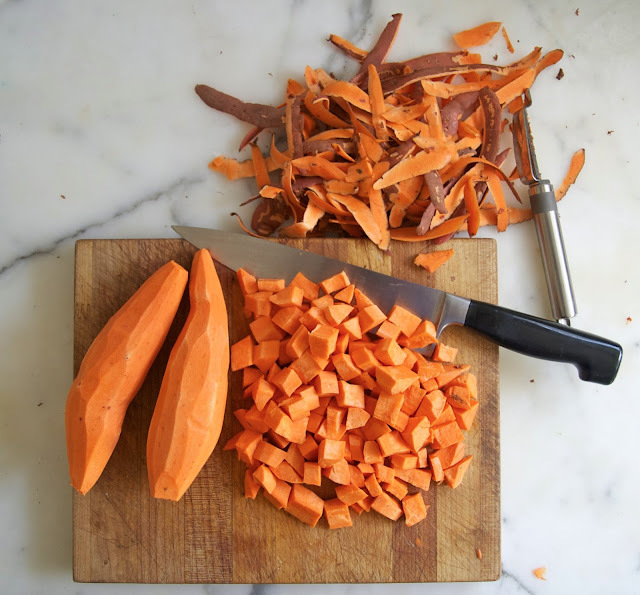 Then, you peeled and chopped up three large sweet potatoes (also known as garnet yams). Sweet potatoes are power house vegetables. When compared with other vegetables they have more complex carbohydrates, fiber, protein, vitamins A, C, iron, and calcium. They should be part of your regular diet. I roasted the sweet potatoes in a very hot oven for 20 minutes while the onions were caramelizing in a skillet. In a cast iron pan, I cooked the cubed mushrooms and soy sausage until they were nice and browned. You can use any brand you like, my favorite are Turtle Island Beer Brats but you could also use Field Roast Sausages or whatever is your favorite. In the end, I gently mixed everything together, salted it and added a couple of cups of baby spinach leaves and a drizzle of aged sweet balsamic vinegar. We ate this for dinner, and I'm eating the leftovers for lunch. Next time I'll probably double the recipe, it's that good! Makes 2-3 servings - Use organic ingredients whenever possible. Remove the brown skin of the onion, half it and thinly slice it. 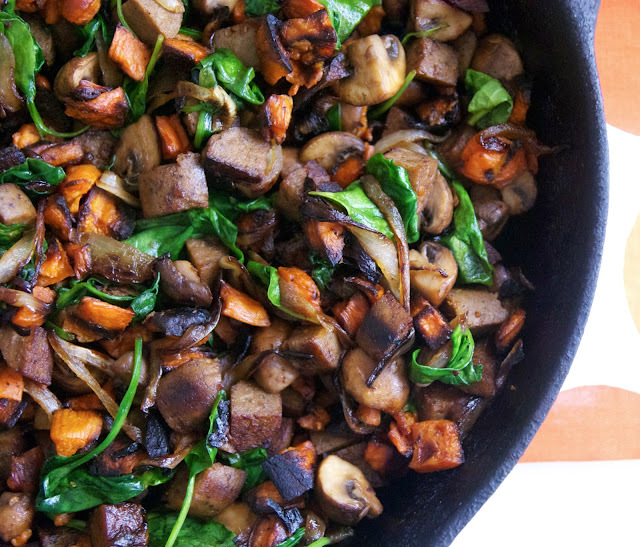 Melt 1 tablespoon of Earth Balance in a skillet over a medium low heat. Stir in the sliced onions, separating the slices. Cook for 30 minutes, stirring every few minutes. While the onions are cooking, peel the sweet potatoes and chop them into 1 inch pieces. Put the sweet potatoes on a baking sheet and pour the oil over them stirring to cover. Roast the potatoes in the oven for 20 -25 minutes or until lightly browned. In a cast iron skillet, melt the second tablespoon of Earth Balance over a medium heat. Trim and quarter the mushrooms. Quarter the sausages lengthwise and chop into small pieces. Add the mushrooms and sausage to the skillet and stir to coat with the butter. Saute them until they are nicely browned, about 10 minutes. When the onions are caramelized, add them to the sausage mushroom mixture. When the sweet potatoes are tender and lightly browned add them as well. Stir in the spinach leaves. Turn off the heat as soon as the spinach has wilted. Drizzle the top with balsamic vinegar and serve immediately. Now THIS is the way to start your day! Beautiful colour and flavour combinations...thanks for sharing! !